The market is at the dawn of a new era where globalization, increased e-commerce, and digitalization strongly impact developments. Intense competition, price pressure, and shorter product life cycles have forced companies to outsource major parts of their production and supply chain to external players in order to focus on their core operations. Properly designed and executed supply chain services can create competitive advantages. With the enormous range of products available, many companies active in today’s information society are encountering both tougher competition and more knowledgeable and well-informed consumers. As a result, the total customer experience has become a crucial element in protecting and developing products and brands. The marketing message concerning products and services cannot be realized unless deliveries and customer satisfaction live up to the purchaser’s expectations. Properly designed, well executed, and efficient supply chain services can create decisive competitive advantages. Just like the graphic industry, the supply chain market has been strongly influenced by access to the Internet and the ability to send information electronically. The demand for supply chain services grows steadily, mainly because there is a growing middle class that demands more mobile consumption of goods which means expanding e-commerce. By outsourcing these services, companies can better guarantee deliveries while not having to tie up capital in plants, personnel, and systems. It also lets them concentrate more on their core business processes like product development, production, and marketing. Supply chain has developed rapidly, particularly on the Asian market where most of production takes place today. The high number of outsourced production units in the region has created a need for the coordination services that Elanders offers. The consumer electronics and automotive industries have been on the forefront of this development for a long time and they are now the leaders. Many companies in these industries outsource large parts of their operations. The global challenges that come with creating a sustainable society are enormous. Higher demands on reduced emissions, lower energy consumption, traceability, recycling, and reduced traffic on roads will soon bring the problems with our present structures to a head. Future supply flows must change from the ground up to comply with sustainability demands. 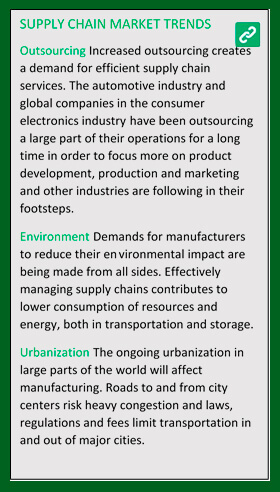 Industries will be forced into far-reaching cooperation to meet sustainability demands. The transparency between suppliers, customers, and even competitors has to grow since a sustainable society needs coordinated production and storage, joint distribution, and a much greater exchange of information. These demands will vastly increase the complexity in supply chains and this will require even more of intelligent IT solutions, traceability, and control. It is reasonable to conclude that as the focus on sustainable development increases in the future, the demand for external supply chain solutions must grow as well.